The outstanding volume and proportions are amplified by its pronounced shoulders and powerful wheelarches that, alongside new 21-inch wheels, combine to create a strong and dynamic attitude. Someone put a lot of thought into describing the new animated functionality of the turn signals in the owner’s manual for the updated 2018 Range Rover & Range Rover Sport. This is kind of a repost but the wording was so thorough I couldn’t resist. The animated turn signal feature is in place to improve the turn signal function by a sequential activation of their light sources. This is achieved by switching on consecutive segments of lights from inboard to outboard and during a defined period of time, creating a sweeping effect. Only lights with LED are able to reproduce any dynamic effect. 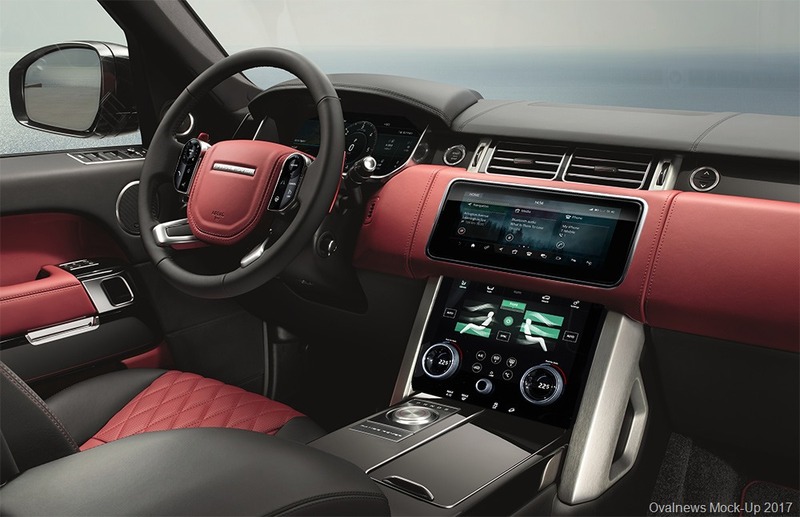 Ovalnews Mock-up 2017, Is this what The Range Rover could look like with InControl Touch Pro Duo? Photoshop’s Perspective Warp really helped to make this mock-up. I know it’s not perfect and there is plenty to nitpick but the general concepts are there – InControl Touch Pro Duo, Steering Wheel Controls, Gauge graphic from Velar, Removed controls rear of Rotary Gear Selector. I was going to stick a Land Rover logo on there but couldn’t get a version I liked. Intelligent Seat Fold or just Remote Seat Fold? World-renowned British adventurer and well-known Land Rover owner Bear Grylls took to the skies to put the New Discovery’s Intelligent Seat Fold technology to the ultimate test. The system allows Discovery owners to configure their vehicle seating through the InControl Remote app on their smartphone from anywhere in the world – even in mid-air. Having jumped from a plane with six members of the Royal Navy Parachute Display Team and freefalling at 125mph, Bear was able to change the vehicle’s seating layout at the touch of a button on his smartphone before he had to deploy his parachute. Once on the ground all the skydivers were able to jump into a camouflaged prototype of the New Discovery, which comfortably seats seven full-sized adults. The world-first Intelligent Seat Fold technology allows the two rear rows of seats to be fully reconfigured in as as little as 14 seconds via the InControl Remote app downloaded on any iOS or Android operating system. Official PR below for full story and yes like all the other tech they show off, seems cool – But, as we see 6 years later and they still can’t even use the 12.3” Digital Gauges right in front of the driver for the demo. Whitley, UK: Jaguar and Land Rover is investing in a 41 mile ‘living laboratory’ project on UK roads to develop new Connected and Autonomous Vehicle (CAV) technologies. The new CAV test corridor, which includes 41 miles of roads around Coventry and Solihull, will be used to evaluate new systems in real-world driving conditions. The £5.5m ‘UK-CITE’ (UK Connected Intelligent Transport Environment) project will create the first test route capable of testing both vehicle-to-vehicle and vehicle-to-infrastructure systems on public roads in the UK. New roadside communications equipment will be installed along the route during the three year project to enable the testing of a fleet of up to 100 connected and highly automated cars, including five Jaguar Land Rover research vehicles. This fleet will test a range of different communication technologies1 that could share information at very high speeds between cars, and between cars and roadside infrastructure, including traffic lights and overhead gantries. Rt Hon Sajid Javid MP, Secretary of State for Business, Innovation and Skills, today announced the UK Government’s support for the UK-CITE research with a £3.41 million grant from the UK’s innovation agency, Innovate UK. This funding for collaborative research is part of the Government’s £100m Connected and Autonomous Vehicles fund. Dr Wolfgang Epple, Director of Research and Technology, Jaguar Land Rover, said: "This real-life laboratory will allow Jaguar Land Rover’s research team and project partners to test new connected and autonomous vehicle technologies on five different types of roads and junctions. Similar research corridors already exist in other parts of Europe so this test route is exactly the sort of innovation infrastructure the UK needs to compete globally. "The connected and autonomous vehicle features we will be testing will improve road safety, enhance the driving experience, reduce the potential for traffic jams and improve traffic flow. These technologies will also help us meet the increasing customer demand for connected services whilst on the move." Connected technologies are key enablers for future Intelligent Transport Systems. These would help traffic authorities monitor and manage traffic flow by capturing data from all connected vehicles and then provide the driver or autonomous car with guidance to optimise the journey. To improve traffic flow, connected cars could co-operate and work together to make lane changing and exiting from junctions more efficient and safer. Technologies like Cooperative Adaptive Cruise Control (CACC) would enable vehicles to autonomously follow each other in close formation, known as platooning, making driving safer and ensuring road space is used more efficiently. In the future, warning messages that are today flashed onto an overhead gantry above a road could be sent direct to the dashboard – and repeated if necessary. This would have the potential to eventually replace the overhead gantry, which each cost around £1m to install. The Jaguar Land Rover research team will be real-world testing a range of ‘Over the Horizon’ warning systems. As well as warning drivers, these would inform future autonomous vehicles, helping them react and respond to hazards and changing traffic conditions automatically. Dr Epple added: "A well-informed driver is a safer driver, while an autonomous vehicle will need to receive information about the driving environment ahead. The benefits of smarter vehicles communicating with each other and their surroundings include a car sending a warning that it is braking heavily or stopping in a queue of traffic or around a bend. This will enable an autonomous car to take direct action and respond. Drivers would receive a visual and audible warning that another car is causing a hazard out of sight or over the horizon. "The approach of an emergency vehicle can often be stressful for drivers. If we can inform the driver, or the autonomous car, much earlier that an emergency vehicle is approaching, we can ensure that the best decisions are made to move the vehicle out of the way safely and conveniently, to let the emergency vehicle pass by." Jaguar Land Rover’s ‘Emergency Vehicle Warning’ system would identify that a connected ambulance, fire engine or police car is approaching through car-to-car communication. The driver would then receive a warning, long before flashing lights and sirens are audible or visible.